Well hello there again! Last week we caught up with professional runner Polina Carlson, where she talked her past year, her upcoming year, and her reaction to the US Olympic marathon trials. As you know I was thrilled watching this year’s trials…the excitement, the suspense, the display the human spirit at its finest. 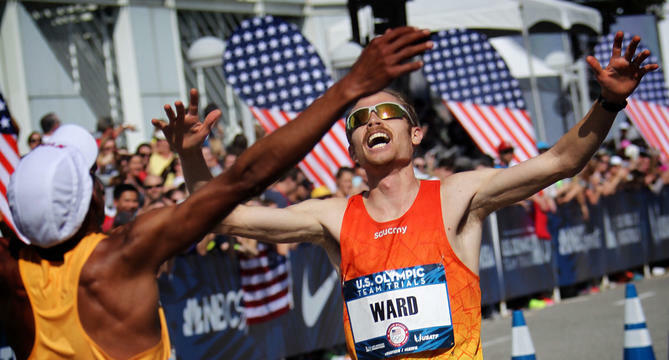 Which is why I am beyond thrilled to bring you this week’s interview with third place finisher and first time member of Team USA Jared Ward! If you watched the trials you saw the impressive display of heart and athleticism he displayed. I wanted a chance for myself (and for you) to get to know Jared better, so I reached out and he graciously agreed to answer a few questions that I could share with you all. At age 27, Jared has had an incredible past year. 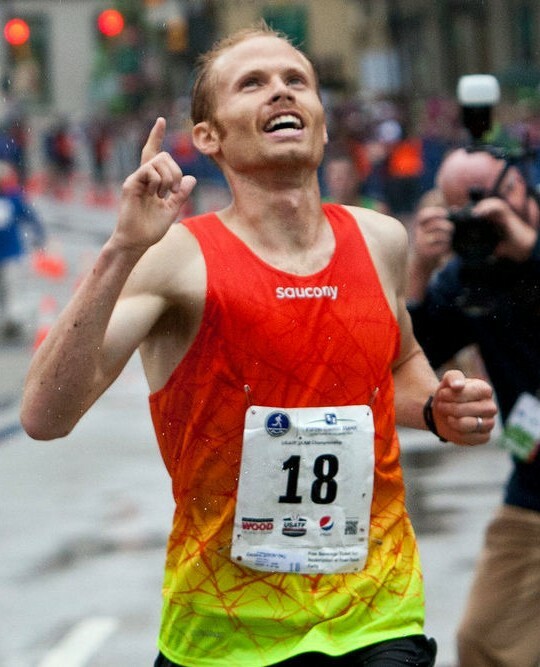 In 2015, he finished 1st at the US Marathon Championships, 1st at the US 25km Championships, and 1st at the US 20km Championships (not the mention making Team USA this February)! He currently resides in Provo, Utah with his wife Erica and 2 children, ages 3 and 1. 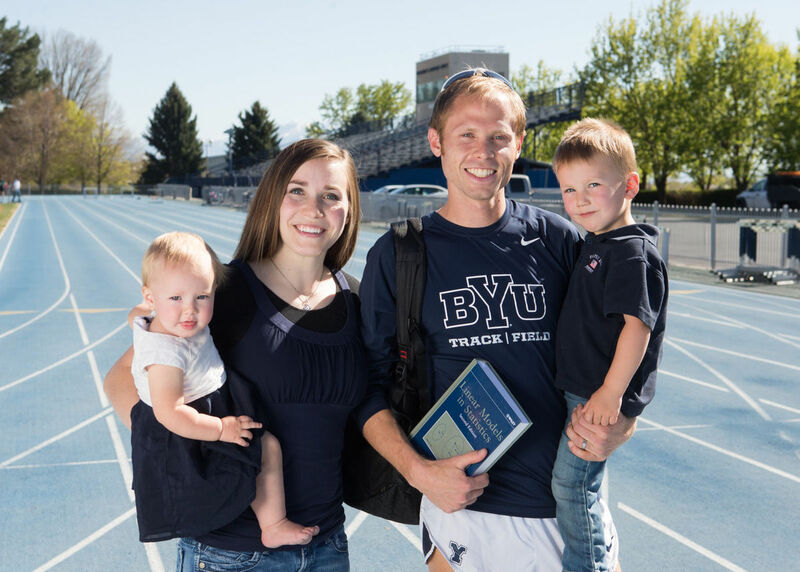 He has a master’s degree in statistics from BYU and even teaches a class in probability. 2016 looks to be an incredible and busy year for Jared, but let’s catch up with him and see what he has to share. Your 3rd place finish at the Olympic Trials has now made you a household name. Can you share a little bit of background that led you to this moment? I always loved running, even from a young age. Some of that was fueled because I was relatively good at the P.E. mile (or relatively bad at the other activities). I remember practicing after school while in elementary when the P.E. mile was approaching in coming days to try to better my time from the previous year. I continued running in Jr. High before school, each time trying to run my 2 mile loop faster than I had the day before. However, I never competed in a “real” race until 9th grade in cross-country, and considered myself a soccer player until my Jr. year in high school. High school I continued to improve, and as a Sr. won my first state title in track. Coach Eyestone signed me for BYU, but I then left on a two-year proselytizing mission for the Church of Jesus Christ of Latter-Day Saints (Mormons). I grew up on my mission and feel the experience really blessed my running–despite not running much for the two years and gaining 20 lbs. Upon returning I have worked with Coach Eyestone and have been blessed to see improvement year after year. It has been gradual, but consistent. What thoughts were racing through your mind on the morning of the Trials? I was really watching a number of athletes race day. I felt like there were about 12 who had a shot at making the team. I was very confident in my training, but when you sign up to race a quality field like what we had at the Trials, you can never be too sure of your chances. Race morning however, I was fairly collected. I knew I had done everything I could to best prepare myself, and I was ready to see how that stacked up to the competition. I was ready to race. Your finishing photo says it all, but what was it like knowing you were making the Olympic team? The feelings coming down the homestretch, being greeted by Meb (Keflezighi) at the line, and the big hug from my wife shortly after were euphoric. I just felt so blessed to have had so many people who invested in me as a person and athlete over the years to make that moment possible. The image of you being welcomed by Meb was incredible. What was that experience like? That is such a perfect example of who Meb is. It was amazing. I have always had so much respect for Meb and look forward to getting to know him better and learning from one of the best America has ever produced. How did your kids react to knowing their Dad would now be an Olympian? My kids are 3 and 1. They love to watch dad run, but I am blessed that they are just as excited for me whether I win or lose. Very low pressure from them. In fact, for most of the race I’m told my 3 yr old just wanted to return to the hotel to go swimming! So what do the next few months look like for you? I’m just going to continue to do what I have done. We will run 3-4 races through the spring and early summer, then get into the marathon cycle 2-3 months prior to Rio. I plan to continue to set incremental goals, practice my nutrition and hydration for the hot humid Brazil weather, and have fun. What are your thoughts on the strength of Team USA? We are sending great teams. I was looking around on the podium realizing that I am joining a group of 6 for which I am the only one to not previously qualified for the Olympics. And 3 of those I join are Olympic medalists. We have a great team. 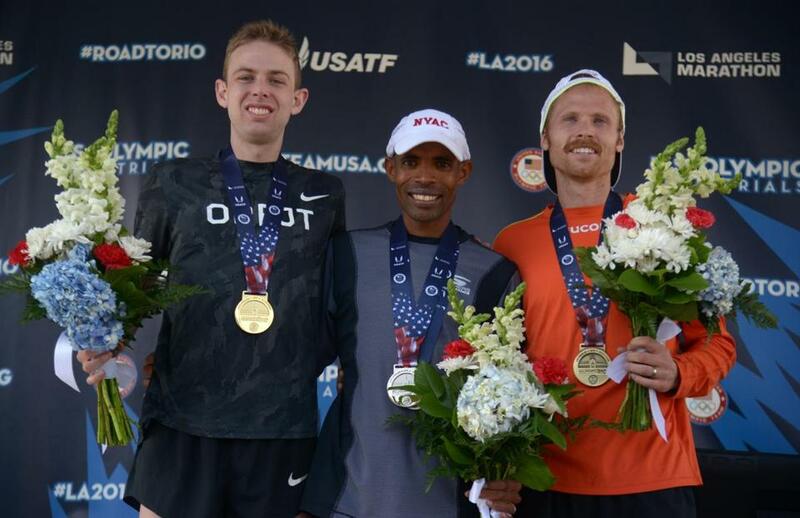 Meb is consistent and experienced, Galen (Rupp) is obviously a promising future talent at the marathon, Amy (Cragg) looked commanding in the LA heat, Shalane (Flanagan) has put up some competitive personal bests, and there are few runners as consistently tough as Desi (Linden). I’m honored to join these guys. Slightly switching gears, who in the running world are you most inspired by? There are many. My coach, Ed Eyestone has always served as a running hero. I also looked up to my high school coaches Corbin Tally and Roger Buhrley as examples. Teammates have also been a great source of inspiration. In high school Josh Adams, and in college Miles Batey and Rex Shields inspired me. I was inspired by many other teammates, Jason Witt, Tylor Thatcher to name a couple. I’ve also had an immense amount of respect for Meb at the international level. I like asking this question of everyone: living or dead, who would you love to go for a run with? I’m a pretty spiritual person, so I’d have to say my Savior, Jesus Christ. I would love a personal one-on-one jog to discuss how I can serve Him. Can you share some words of wisdom with anyone eyeing a career in running? Just be consistent. If you want to continue to progress you need to run year-round and look to gradually and consistently improve. The jump doesn’t happen overnight, it happens over years upon years. Consistency leads to improvement and injury prevention. Lastly, what is the best way for people to follow you on your journey? I’m on Twitter and Instagram. I haven’t began blogging yet, but I hope to highlight this journey to Rio, and will link to the blog via Twitter and Instagram! Be sure to leave some love and support for Jared in the comments section below! Heartfelt congratulations and high fives to Jared for such an amazing finish at the trials! What a thrill it was to watch. Thanks for another great post!